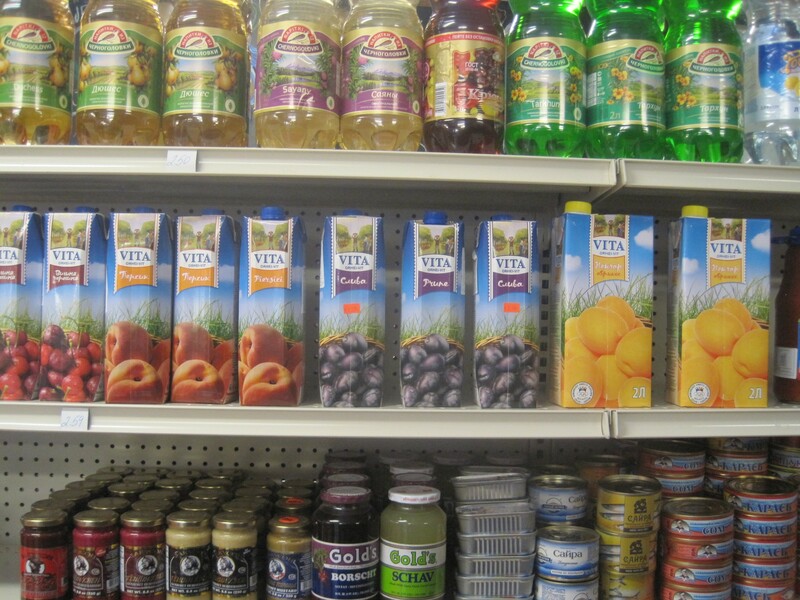 It's only minutes away from the Seven Days office, but I never thought to venture into St. Paul Street's Neighborhood Market until a Russian friend recently told me it was her source for old-country groceries. Yesterday, I finally made time to snap up some hazelnut-filled chocolate and frozen Siberian beef dumplings. I was tantalized by soup mixes, hard and soft cheeses and an impressive array of cured meats, but those will have to wait for next time. I was too busy choosing my lunch to do a serious shop. Neighborhood Market recently started promoting its deli fare, prepared to go or served at the small counter near the cash register. I was disappointed to see there was none of the Russian cuisine I expected. Some blinchiki or pelmeni would have really hit the spot. 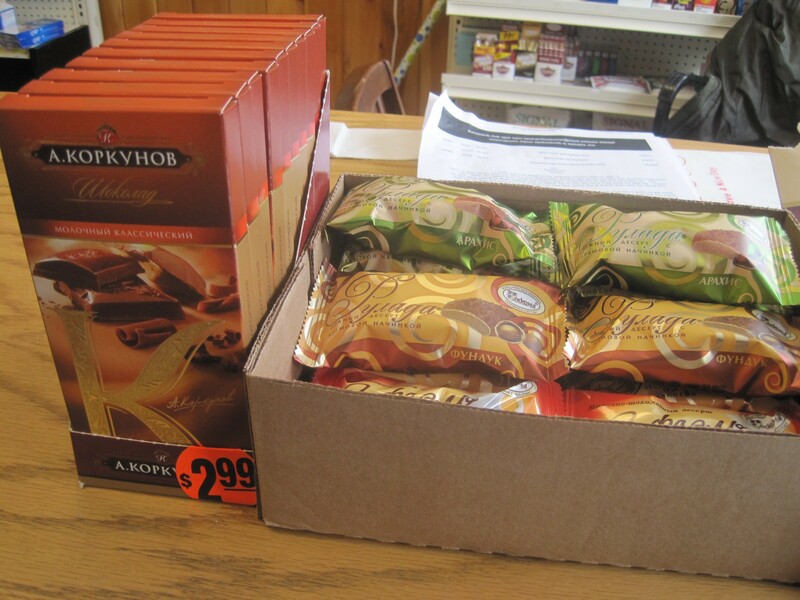 But the young Moldovan woman working the counter told me she believed that the market's neighbors were only interested in American basics. Lucky for me, a few of those had a touch of the exotic. When I visited Poland a few years ago, most dishes at casual restaurants came with a few pickled salads on the side, referred to as "sets of salads." 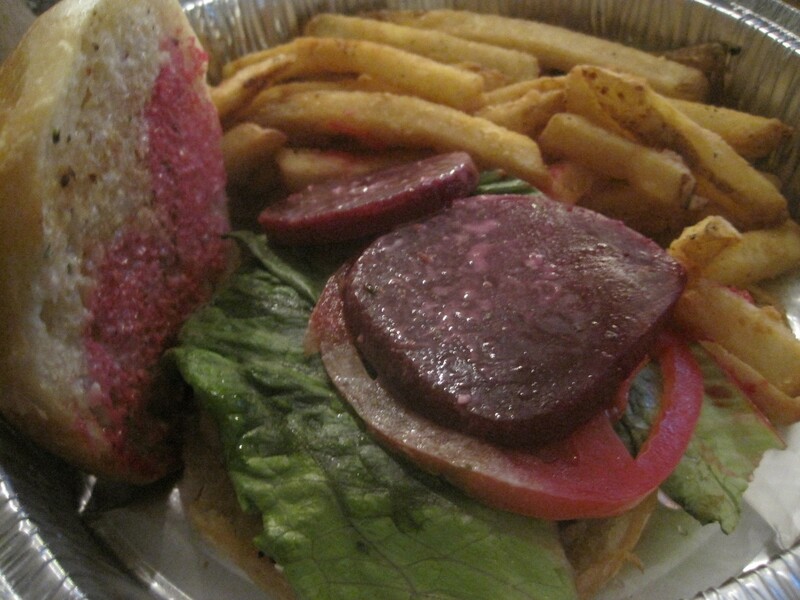 Marinated beets were always a part of the combo, so it struck a chord with me to find a beet burger on the menu. It lent a Slavic touch to a very well-made basic burger, which I brought back with me to the office (my excuse for the less-than-beautiful photos). The beef patty was nicely seasoned and grilled with a thick stripe of red left in the center. I wouldn't have minded more of the tangy pickled beets on top, but once carefully placed, there was enough to make it into nearly every bite I took. They might have stayed in place better if they'd been stacked directly against the mild Provolone cheese that enrobed the beef. That cheese (or cheddar) and the buttery ciabatta roll are standard for all the deli's burgers, including one topped with bacon and another with egg. Still, I would love it if there were options that used some of the Eastern Bloc ingredients in the market's fridge. 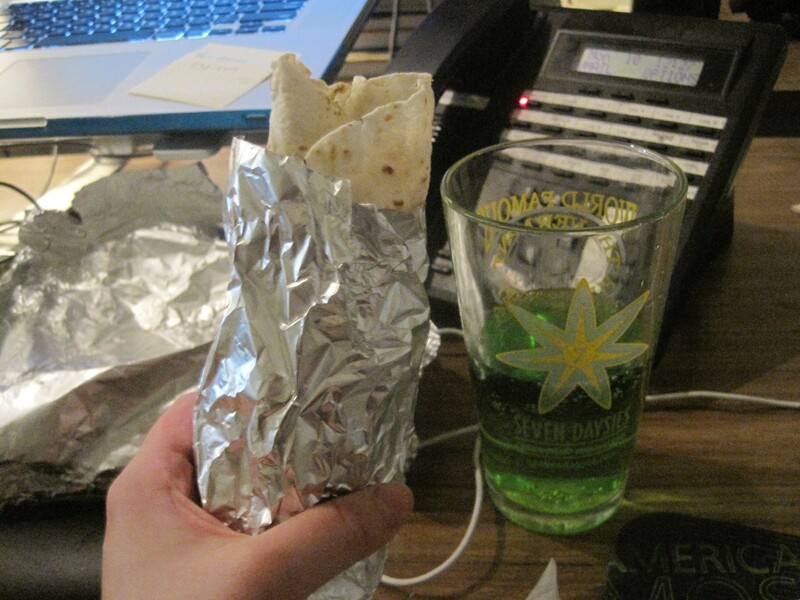 I also tried a chicken shawarma wrap for a taste of Eastern street food. "You should eat it like ice cream cone," the young lady at the counter told me. I followed her advice, holding the wrap upright to bite in. The chicken had a nice touch of flame from the grill, but was otherwise plainer than I'd hoped. The tender tortilla was also filled with tomato, lettuce, cucumber and a combination of ketchup and mayo. It was a bit of a McDonald's approach, but I have seen similar fare in Eastern Europe. I paired my meal with crisp, battered truffle fries for only $2.45. They were an indulgent workday treat that my colleagues couldn't resist, even after I'd had my fill. I'm a sucker for ethnic sodas, and Neighborhood Market has one of my favorite Russian delicacies: a bright green sip flavored with tarragon. I hadn't seen a bottle anywhere in Vermont before and was thrilled to be reunited with the licorice-tinged drink. Next time, I'll grab my own bottle of pear soda that the counter lady shared with me while I waited for my lunch. Either one would be delicious with a Slavic dish or three, still a void in the Burlington dining scene. But until then, a beet burger and truffle fries will have to do.